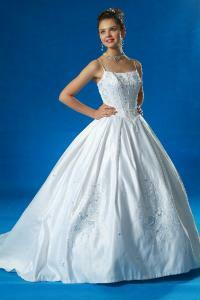 This brand new corset style bridal gown is flattering. 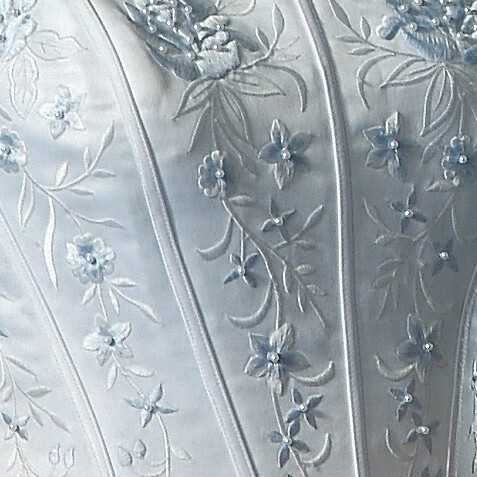 The satin corset style bodice with spaghetti straps is boned. 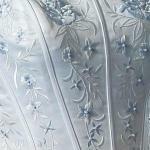 The bodice dress is accented with gorgeous baby blue floral embroidery with pearl beading. The back of the gown laces and is adjustable. The Basque waist flows down to a semi-cathedral train featuring matching embroidery and beading. The skirt is fully lined with built in netting. An additional crinoline is recommended if a full skirt is desired (as shown on photos). This gown retails for $600.00.